Islamabad July 13 (IANS) At least 70 people including a political leader were killed in a horrific suicide bombing targeted at a rally in Pakistan s Balochistan province on Friday. 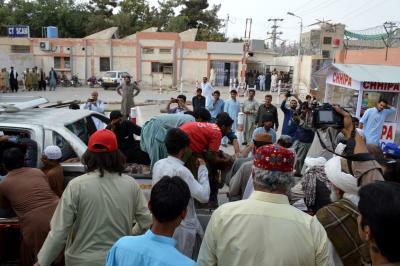 It was the third such attack on election candidates in the run up to the July 25 general elections. Balochistan Awami Party (BAP) candidate Siraj Raisani was killed along with 70 people while 120 were injured in the blast in Mastung district. Raisani a candidate of the recently-formed BAP is the younger brother of former Balochistan Chief Minister Aslam Raisani. Balochistan security forces told the media that Siraj was attacked during a corner meeting organised for the promotion of his candidature. Siraj s death was confirmed by his brother Lashkari Raisani. Balochistan s Civil Defence Director Aslam Tareen said 8 to 10 kg of explosives and ball bearings were used in the attack.